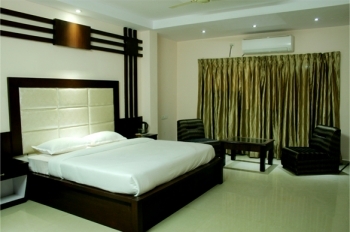 Hotel Jasmine is one among the highly hospitable and modernized hotels located in Haridwar. It has a world class system and training culture to deliver customer delight by continuously raising the levels of customer satisfaction. The hotel is well equipped with all the modern facilities and amenities required by the guests on their stay in the hotel. The scenic location of Haridwar makes it even exciting for the guests to stay at the hotel. The jasmine Hotel is well equipped with facilities like an attached bathroom, spacious rooms, LED TV and so much more. The hotel is a perfect place for all kinds of guests be it travelers, family, couples or even business associates. Hotel jasmine is a great place to get rid of all your travel fatigue and take a pause and enjoy the hospitality the town of Haridwar has to offer. 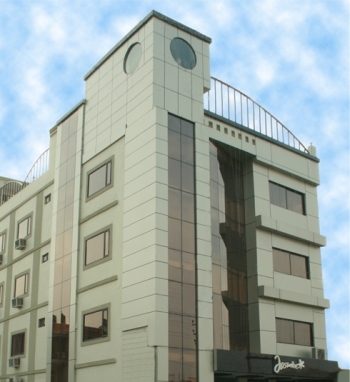 The Jasmine Hotel is located in SIDCUL, Haridwar just 500meters away from the Pentagon mall. The rooms in the hotel are well facilitated and are fully equipped with all the necessary and required amenities. The rooms are designed while keeping in mind all the luxury and comfort that every guest will require. The rooms in the Jasmine Hotel are divided into two major categories. Deluxe Rooms- The deluxe rooms are deliver a statement that is stylish and functional. The rooms are fully equipped with amenities like Double/Twin bed, LCD TV, Free Wi-Fi, Sofa Seating, Attached washroom with running water and so much more that the guest would be requiring on their stay. Executive Rooms- The executive rooms are designed to deliver a rich aura of a contemporary environment. The room is well equipped with all the amenities like air conditioner, bathroom accessories, attached washroom and so much more. The Jasmine Hotel has an in-house restaurant where you can enjoy the best of the various cuisines served here. The hotel serves multi-cuisine dishes in many flavors. You get to gorge on to freshly made and deliciously cooked meals. With exotic drinks and beverages the hotel Jasmine has an amazing restaurant to dine at. By Road- There are a number of bus and taxi services that are available from main Haridwar town to the Hotel. You can travel till Haridwar from ISBT Kashmiri Gate, New Delhi and then further travel till the hotel from the Haridwar Bus Stand, situated a distance of 10km. By Railway- The nearest railway station is the Haridwar Railway Station that is located at a distance of 10km from the hotel. You can travel through a taxi,, cab or local transport and reach at the Hotel Jasmine. By Air- The hotel is located at a distance of 50 km from the Dehradun Jolly Grant Airport. You can reach at Haridwar and then further travel through a cab or by taxi till the Hotel Jasmine.